It is very easy to compromise on our way of living in our workplace and educational institutes due to peer pressure. King Solomon married wives of other nations who worshipped idols and to keep them happy he compromised and started worshipping idols. In the beginning, he thought that there is no harm in doing so but ultimately due to his sin Israel nation got divided into two. We had a family friend, a sister, who was a true testimony in her college as well as in her company. When she was in her college, she testified about Jesus to her friends and one of her friends accepted Jesus as her personal savior. She used to live in a PG (an acronym for Paying Guest), her life was a testimony wherever she went. She was a comfort to people around her, due to her life and testimony, many girls in that PG came to Christ and they came with her to church. For many people, your life is the only Bible that they are going to see and read in their life. Your way of living and words that you speak reflects the characteristics of Jesus. When you have the realization that Christ lives in you, automatically your way of life will change. You may not be a preacher but your life will speak out loud to the people around you. 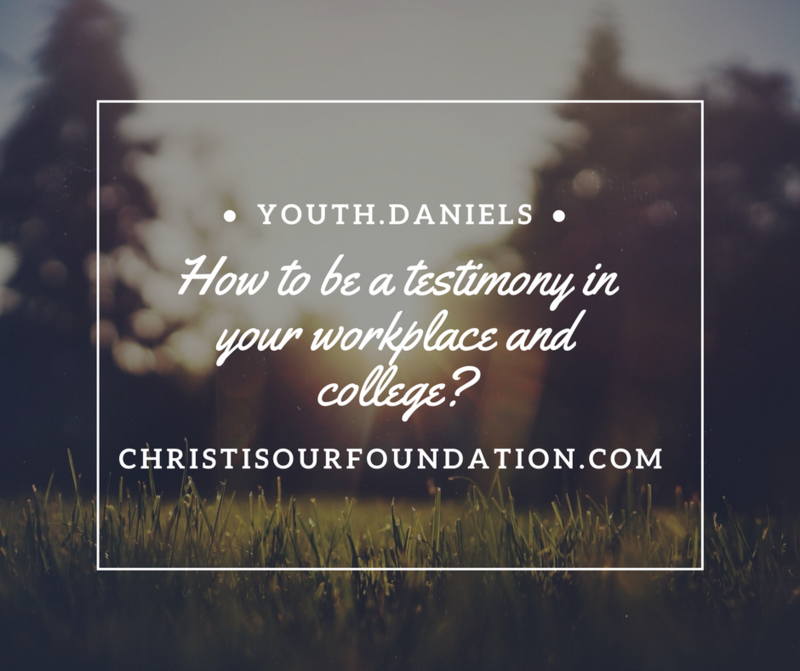 How to be a testimony among your colleagues and friends? Say No to everything that is against the word of God. You may have to say no more than once but when they know that you won’t compromise they won’t bother you ever to do it. Don’t compromise even on little things. Be faithful even in the smallest of the things only then you will be able to stand strong when storms will hit you. Don’t hesitate to share the word of God and pray for your friends in time of needs. Don’t get carried away if they start making fun of your choices and way of living based on Bible. Many people are waiting for persecution to prove their love for Jesus but let me tell you, it’s not just for that day rather it’s an everyday process where your life shows who Jesus is. Once during a prayer meeting, few gangsters enter the prayer meeting with guns and knives. Their demand to the people was to disown Jesus or die, everyone including the Pastor disowned Jesus and leaves the place except for the pregnant wife of the Pastor who refused to disown Jesus. She was killed on the spot by goons. They killed her by slicing her throat. Today she would be heaven with Jesus. Every second of your life, keep reminding yourself that if your name is not there in the book of life you won’t enter heaven. Be a Testimony and live a life of Testimony.